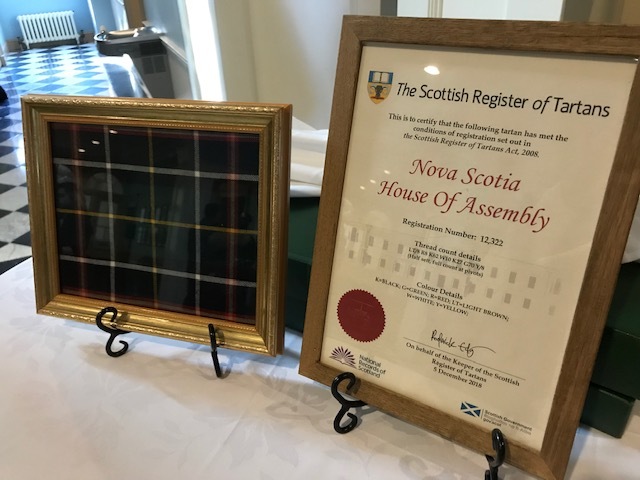 On April 5, as part of the commemorations for Province House’s 200th anniversary, Speaker of the House of Assembly Kevin Murphy and Minister for Gaelic Affairs Randy Delorey unveiled the official Nova Scotia House of Assembly Tartan. The official designation was brought about through House of Assembly Tartan Act, also introduced by Minister Delorey. The Act also designates April 6 as Tartan Day, in appreciation of the Scottish clans in Canada. The Tartan was designed by Veronica MacIsaac, a local Nova Scotian fashion designer whose parents own MacIsaac Kiltmakers in St. Peter’s, Richmond Co. It was designed to reflect both the past and the future of our House of Assembly in a way that pays tribute to Nova Scotia’s deepest roots. MacIsaac’s artistic works have been widely recognized at fashion events and publications throughout the world. The colours of the Tartan represent important emblems that embody the House of Assembly, including green for the Legislative Chamber, red for the Red Chamber, black for the speaker’s and clerks’ robes, yellow-gold for the mace, white for the laws passed by the House of Assembly and tan for the sandstone exterior of Province House. If you want to learn more about the Tartan, visit https://www.tartanregister.gov.uk/tartanDetails?ref=12322.